Menulog delivers for Wok N Bowl so you'll be able to track your courier on a map. With rice. Tendered beef in coconut milk flavoured with an additional of Thai spice, tossed with potato and onion. With rice. Stir-fried Chinese broccoli with crispy pork belly in light chilli sauce with basil. Stir-fried stick noodles with egg, been sprouts, crushed nuts and a wedge of lemon. Flat rice noodles stir-fried with Chinese broccoli. Flat rice noodles stir-fried with chilli, basil and mixed vegetables. Hokkien noodles stir-fried with garlic, tofu and mixed vegetables in sambal sauce. Fried rice with egg and mixed vegetables in a spicy soy sauce. Meat or tofu with red curry paste in coconut milk, bamboo shoots and mixed vegetable. Meat or tofu with green curry paste in coconut milk, basil, bamboo shoots and mixed vegetables. 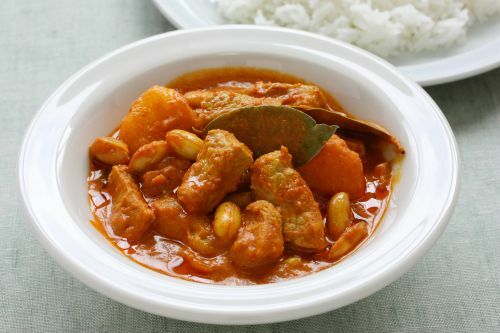 Meat or tofu with curry paste in coconut milk and vegetables with crushed peanuts. Coconut curry soup with Hokkien noodles, tofu or meat and vegetables. Slow cooked clear soup with vermicelli noodles and vegetables. A sweet and sour soup spiced up with lemongrass kaffir lime leave, galangal and corriander together with Thai chilli paste.